So I welcome as I return with a series of tribute to Madeba. The following morning when listening to ABC Fran Kelly interview former Foreign minister Gareth Evens spoke on the passing of Mandela. What quickly became apparent was the lack of Statesmanship and the ignorance that is held by members of the Abbott Ministry. 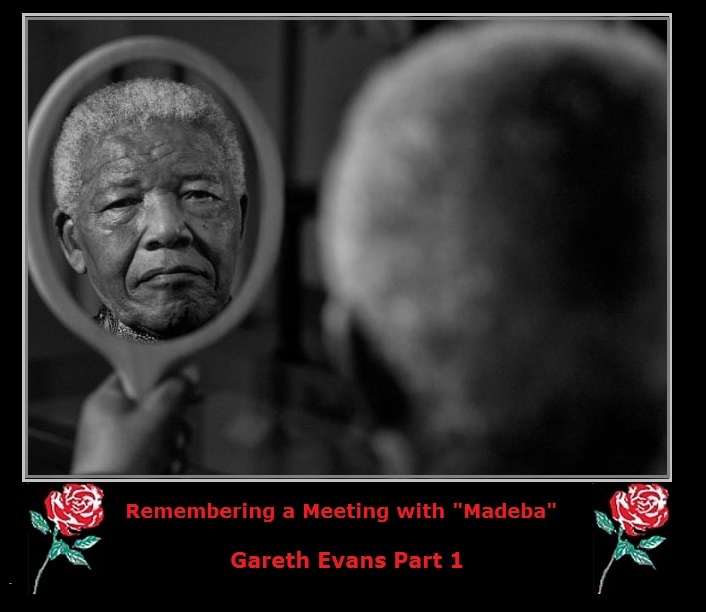 It was never made more apparent when you listen to the articulation of Gareth Evans in that interview. In the process of searching out (and not finding) Abbott”s ROLE as a young man in opposing the Anti -Apartheid movement ……I found the following Nelson Mandella day address 2012 by……. It’s is a lengthy read perhaps not designed for Facebook but then we on this page do not do it the conformative Facebook way by simply posting a link and leaving the rest up to you. The following is faithfully reproduced with only the additions of white space, and headings to ease later reference and reading with a couple of annotations here and there. Of all the meetings with all the leaders and other international figures around the world I have had during all the years of my public life, there is no question as to the one which gave me most pure joy. That was my first meeting with Nelson Mandela, just a few days after his release from prison in February 1990, in Lusaka where he had flown to meet his ANC colleagues in exile. 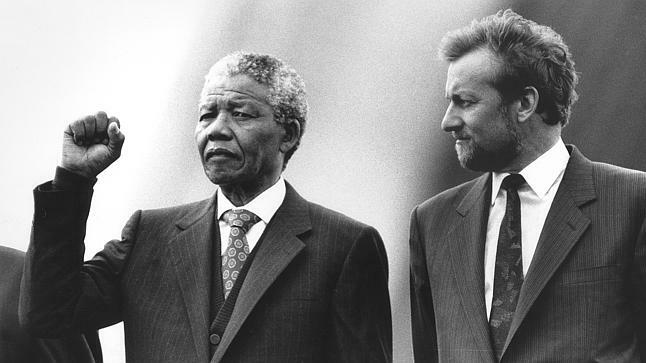 Partly it was a matter of coming face to face – sitting across a table, just the two of us – with a man who had long been a personal hero to me since my days as an anti-apartheid student activist, and being simply overwhelmed by the personal qualities that so quickly came to be recognized and applauded so universally around the world. Madiba is simply the most impressive and humanly decent statesman I have ever met, or am ever likely to meet. I was captivated then, and have remained captivated since, like so many others – including every Australian he met during those wonderful visits here – by that huge luminescent smile, by his unending charm and grace, the lucid intelligence with which he discussed his country’s transition problems, but above all by that extraordinary, almost unbelievable, lack of bitterness toward his Afrikaner gaolers of 27 years. But another big part of my joy at that meeting back in 1990 was Madiba’s willingness to meet me, as an Australian minister – and I was one of the very first foreign officials to greet him – to thank Australia for the significant role we had played, despite no pretensions on our part to be a major power, in South Africa’s transformation, and I want to spend a little time this evening tracking back over some of the perhaps now largely forgotten things that we did. My personal understanding of and commitment to the anti-apartheid cause was triggered, as was the case for so many others around the world, by the Sharpeville massacre in 1960, while I was still at school. When I went to Melbourne University a couple of years later, and became intensely involved in student politics in the mid-‘60s, no issues mattered more on our and other campuses than racism: the need to overturn the White Australia policy once and for all, to get some redress for Aboriginal Australians, and to end the scourge of apartheid. In 1965 I led a student protect against the arrival of the Springbok rugby team, out at the old Essendon airport. We wore rugby jumpers and black face paint and held up placards saying ‘Why Won’t You Play with Us?”. We were pushed back by the police beyond a wire fence, too far away to be actually noticed by those great burly players with shoulders almost wider than the doorway of the plane from which they emerged. So in my first act of protesting heroism, I jumped over the fence and ran towards the plane with my team of protesters following a little more hesitantly – only to be crash-tackled to the ground by an equally huge policeman, held in an agonizing armlock, and thrown back over the fence. It was at that stage that I decided that the rest of my life was going to be devoted to peaceful protest rather than the more adventurous kind. International pressure on the apartheid regime began slowly in the 1960s, with oil and arms embargoes and other sanctions gaining some momentum in the 1970s. The Commonwealth, with the Australia very much in the lead, played a vital role in launching the sports boycott. Prime Minister Gough Whitlam announced in December 1972 that sporting teams selected on the basis of race would not be allowed to enter Australia, and this position was further strengthened by the Fraser Government which supported the UN General Assembly resolution on apartheid in sport in 1976 and became party to the Gleneagles Agreement in 1977. While most of my focus will be on Labor Government initiatives, because we were in power at the crucial time, it should be acknowledged that Malcolm Fraser deserves real credit for the political risks he took with the anti-apartheid issue, A DEEPLY UNPOPULAR POSITION IN HIS OWN PARTY ROOM and among conservative voters during the whole transitional period: there is absolutely no doubt that his personal convictions on matters of race, in South Africa as elsewhere, were absolutely genuine and heartfelt. Given the breadth and profile of the contacts forbidden it is fair to say that Australia – closely followed by New Zealand – suffered more pain with the sports boycott than anyone else. Or at least anyone else than the cricket and rugby mad white South African community: the sense of isolation and deprivation was not in itself enough to bring down apartheid, but it unquestionably played a psychological role. It was not until 1985-86, in reaction to the further cycle of violence and repression then occurring that really wide ranging and substantial economic sanctions were put in place by the international community. The Commonwealth, then European Community, U.S. and individual Nordic countries led the way, each drawing successively on precedents set by the others and so creating a ‘wave’ phenomenon. The new Australian Prime Minister Bob Hawke, who very deeply committed to the anti-apartheid cause, became deeply engaged with the issue at successive Commonwealth meetings during this period, and took the campaign forward in a whole new direction at the 1987 Vancouver Commonwealth Heads of Government Meeting (CHOGM), suggesting that a major new emphasis be placed on financial sanctions as the best way of putting the screws on the South African regime. As the 1980s wore on the international community had been gradually coming to the realization the sanctions on trade in goods and services, like the sports and cultural boycotts, were going to be insufficient, and that there had to be some real additional discipline in the form of drying up the sources of trade credit and investment funds, and general support through the banking system. A movement to apply such sanctions had been initiated in city and local governments in the U.S., through the black caucus in the Congress, and pressure on corporate private lenders. But until 1987 this trend did not really have coherence or focus, and no serious analytical work had been done to establish whether a worldwide financial strike could be sustained, and if so what difference this would make to the South African economy. 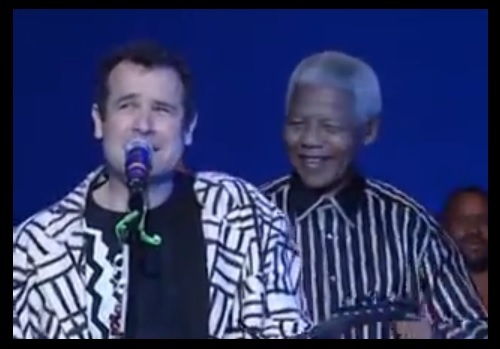 In 1969, British born South African Johnny Clegg formed the first racially mixed South African band, Juluka, with Zulu musician Sipho Mchunu. Because it was illegal for racially mixed bands to perform in South Africa during the apartheid era, the first album “Universal Men” was banned on South African state owned Radio but it became a word-of-mouth hit.